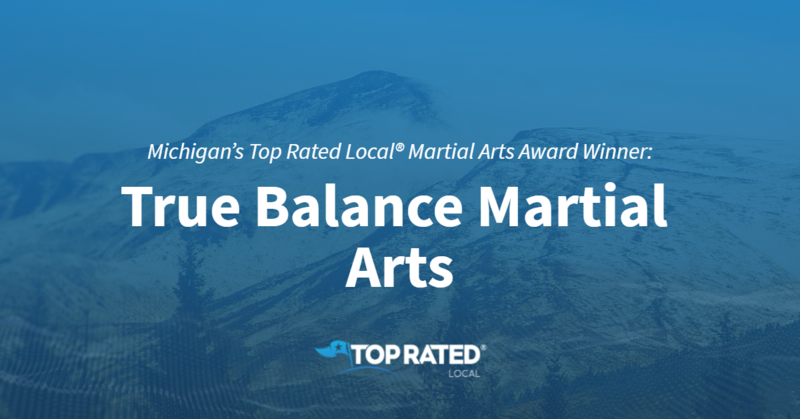 Top Rated Local® is pleased to announce that True Balance Martial Arts is a 2019 award winner for martial arts centers in Michigan! If you or your child is interested in learning martial arts, True Balance Martial Arts in Sterling Heights is the place to go. True Balance Martial Arts has received dozens of reviews on four verified sites with an average rating of 4.92 stars, earning them a fantastic Rating Score™ of 4.92 and a 2019 Top Rated Local award for ranking among the top 10 martial arts centers in all of Michigan! “[This is a] great school with wonderful instructors who not only give a pleasant and safe environment to learn and practice martial arts, but also show effective and practical self defense techniques! Out of the several schools I’ve trained in, I definitely recommend True Balance Martial Arts!” – Zuzanna G.
Sean, the owner of True Balance Martial Arts, generously gave us a few minutes of his time to tell us a little bit about his award-winning business and its spectacular online reputation. Sean credits True Balance Martial Arts’ strong online reputation to their commitment to treating their clients the way they would want to be treated. Congratulations to the team at True Balance Martial Arts for being a 2019 Top Rated Local award winner, and thank you so much, Sean, for taking the time to speak with us! We highly recommend True Balance Martial Arts in Sterling Heights. Visit their website today!